Food Network magazine is one of my favorite cooking magazines. It is well made, has good articles, great recipes, and every issue comes with a handy pullout booklet. It is a small booklet, but always contains 50 of something: 50 ways to dress a baked potato, 50 things to make with bacon, etc. 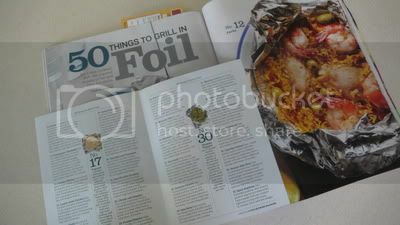 Our latest issue came with 50 Things to Grill in Foil. Seeing as how Memorial Day Weekend usually involves grilling, we did the hot dogs Friday night, and planned on the Paella recipe from the magazine for Monday evening. Best laid plans…right? But first, let us begin with the putting together of the meal. I’ll get to where it all fell apart later. 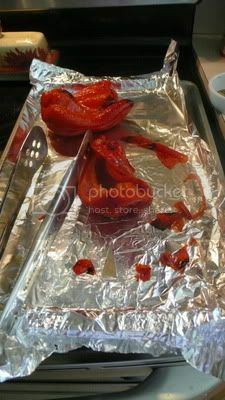 The ingredient list is a little long, but aside from roasting peppers, the preparation of the meal was easy. Getting the ingredients was not. I could not find chorizo in our grocery store. Finding a Spanish rice mix that did not include bad things (i.e. HFCS or MSG) proved impossible. 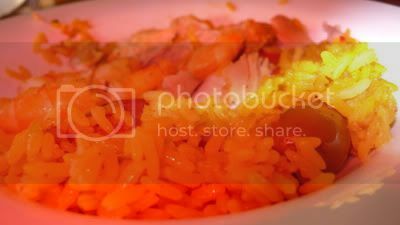 Next time, I’ll make the drive to Wegman’s and possibly just make my own saffron rice. 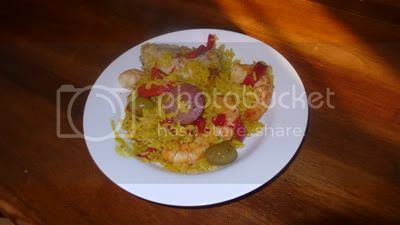 All you need for this are the ingredients: skinless chicken thighs, jumbo shrimp, chorizo (or, if you’re me, another dried Italian sausage), packet of Spanish rice mix, olives, and roasted red pepper strips. 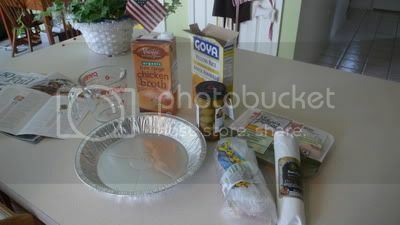 This all gets put into a disposable pie place and mixed with chicken broth, then covered with foil and thrown on the grill. 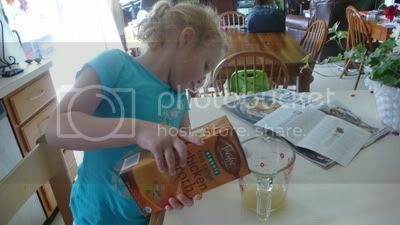 Evie helped with the meal preparation until the raw meat came out. Here’s where the fun started. Mark heated up the grill to roast the red peppers. The gas ran out for the grill. He suggested we just use the oven. I balked, stating that this recipe was for the GRILL, we should use the GRILL to make it! Out goes wonderful hubby for more gas for the grill. Comes back, it doesn’t work. Trouble shoots for awhile (did I mention I’m married to an engineer? ), decides it must be a defective tank, goes out AGAIN for another tank. In the meantime, peppers go under the broiler. Turns out, after all of that, our grill is shot. SO, the GRILL meal became the “cooked in oven meal.” It was wonderful. I imagine it might have been even tastier from the grill, but cooking it for double the time (30 minutes on grill at medium high, we cooked it at 400° in the oven for an hour and that did the trick). As we say in this house, it is a definite repeatable recipe. Evie’s portrait of her plate.